Often it can be a challenge to discover a property or destination that is ideal for an incentive program, an upper-level meeting, a romantic getaway, as well as a family vacation. The Sanctuary at Kiawah Island Golf Resort satisfies all of these objectives. The Sanctuary is a combination of extraordinary southern hospitality and a relaxed atmosphere. Its lush surroundings include oceanfront dunes that are natural and all-encompassing. Just 30 minutes from Charleston, S.C., it is relatively easy to reach. 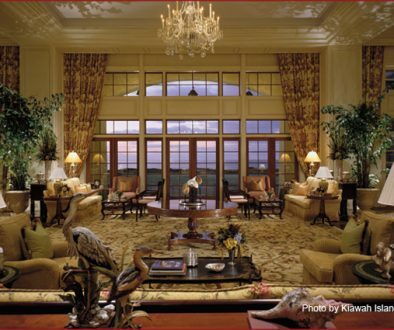 Kiawah (pronounced Kee-a-Wah) is on a carefully developed 10,000-acre barrier island. It lies along the Atlantic Ocean with 10 miles of one of the top beaches of America. The island is a sanctuary for wildlife, including egrets, loggerhead turtles, and alligators. 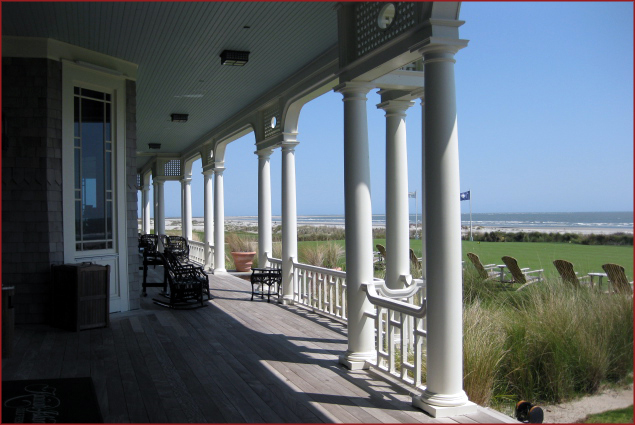 Long known as an exceptional golf destination, Kiawah Island started with many villas and condos. When we lived in the Carolinas, we experienced Kiawah as a perfect getaway. The addition of the Sanctuary in 2004 took the island to an entirely new level. When the hotel was opened in 2004, it represented the finishing touch to an exceptionally well-developed destination. 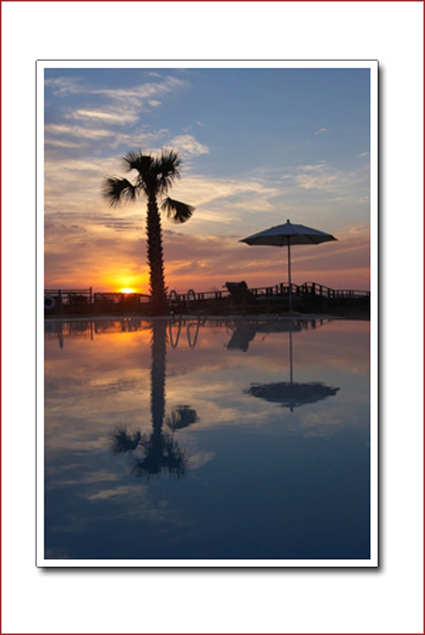 Ocean, dunes, wildlife, and casual atmosphere in luxurious facilities combine to provide an elegant feeling. The Sanctuary appears like a stately seaside mansion gracing the grounds. Its exterior is manicured with welcoming gardens and pathways leading to the boardwalk and ocean. Upon entering, the interior greets you with grand spaces and high ceilings, two massive sweeping staircases, and ballrooms on one end and a luxurious spa on the other. Antiques and comfortable seating areas, including a library, provide private and intimate gathering retreats. The Sanctuary was designed to provide the feeling of a 19th-century Southern mansion. It is decorated so authentically, you would not realize it only opened in 2004. What sells the Sanctuary for me is exceptional service. It is a five-star, five-diamond property with six- star-plus service. The level of service surpasses that of many other properties in the same category. The resort staff has an exceptionally low turnover rate and, according to staff, it should continue to stay low. The staff is friendly, loyal, helpful, and pays attention to every detail. At every level, they are happy and proud to be there. 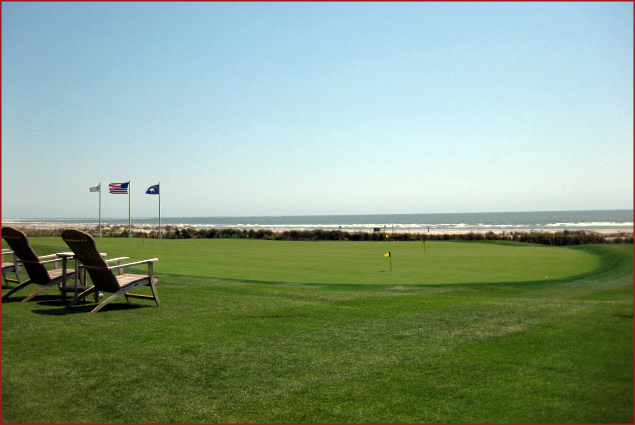 Long famous for its golf, Kiawah also offers numerous other activities. The resort boasts five championship golf courses by top designers: The Ocean Course by Pete Dye; Osprey Point by Tom Fazio; Turtle Point by Jack Nicklaus; Cougar Point by Gary Player; and Oak Point by Clyde Johnson. I played the Ocean Course in 2005. The terrain was beautiful and the course was windy and extremely difficult, resulting in one of my not-very-good rounds. For tennis lovers, the Sanctuary was rated one of the top five tennis resorts by Tennis magazine. There are 23 clay courts, five hard courts, and a practice court. The spa is one of only 13 Forbes five-star spas in North America. It features 12 treatment rooms. Treatments are derived from the ocean, forest, and botanical extracts. Many of the ingredients are indigenous to Kiawah. Whether you want to indulge with a Mint Julep Facial or Lowcountry Verbena Body Polish, a complete line of services is available. I experienced the Signature Massage one day and had to go back for Reflexology the next, after discovering the therapist specialized in that area. This was also an exceptional treatment. The nature center with staff naturalists offers different programs all week long. Walking tours, marsh creek canoeing, ocean kayaking, back-river excursions, and biking are all available. During a prior visit, we rode a tandem bike all over the island. Food service throughout the property is consistently good. The culinary team is headed up by executive chef Robert Wysong, CEC, who oversees all restaurant and banquet dining experiences. Banquets and catering are always a challenge for meetings or incentives. The Sanctuary is willing to work with meeting planners to keep costs within budget. With the meeting we attended, breakfasts were different each day, as were appetizers at the cocktail receptions. Food at our two banquet functions was superb. All were prepared with the finest attention to detail in presentation, flavor and freshness. One evening, we dined at the Ocean Room at the Sanctuary. This is the resort’s premier steakhouse. 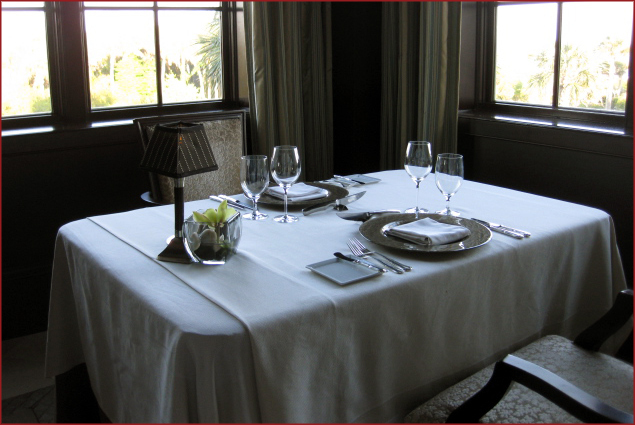 It holds the distinction of being the only Forbes Four Star/AAA Four Diamond steakhouse in the U.S. Chef de cuisine Nathan Thurston and his team source the finest meats from artisan and local cattle ranches. The menu also has fine choices for the non-meat diner. While we were dining in the Ocean Room overlooking the sea, Chef Nathan was cooking at the James Beard House in New York. His team carried on without a glitch in the service. The wine list paired well with menu offerings, providing global varietals to complement everyone’s dining experience. Jasmine Porch also has an ocean view. Chef de cuisine Ryley T.McGillis features traditional Lowcountry favorites, as well as casual selections. Its dishes are presented well and portions are quite large. It is a popular gathering spot for guests. Chef de cuisine William Morrison heads up the Atlantic Room at the Ocean Course clubhouse. This is the Sanctuary’s premier seafood restaurant. We enjoyed a delicious and relaxing lunch overlooking the course. There are other alternatives we did not experience: the Osprey Point Grill offering casual fare; Tomasso at Turtle Point Clubhouse, with its classic Italian cuisine; Loggerhead Bar and Grill, which is poolside at the Sanctuary; Shrimper’s in The Straw Market in West Beach; Night Heron Poolside Grill and Bar; the West Beach Market; and the Market at Town Center. 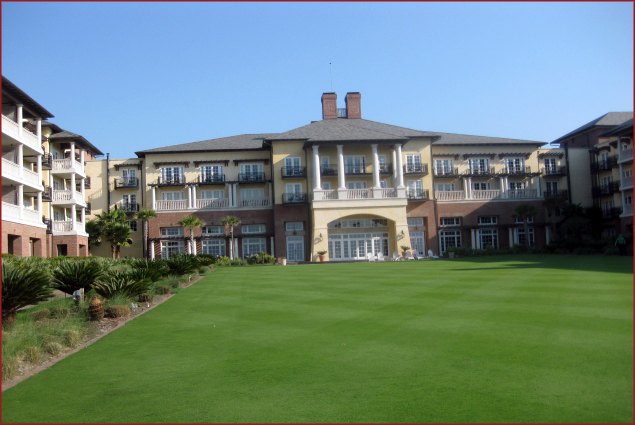 The Sanctuary at Kiawah Island Golf Resort is a 255-room, ultra-luxury oceanfront hotel and spa and AAA Five Diamond and Mobil Five Star property. Additional units/villas on Kiawah Island are available in The Villas at Kiawah Island Golf Resort. Six hundred spacious and well-appointed private luxury homes are included. At an earlier time, we’ve been fortunate enough to stay in two different units. They both exceeded expectations. Meeting space is over 19,000 square feet. In addition, there are several unique outdoor function areas. The list of awards given to this destination are as long as this article. If you would like to view the list, I’d suggest clicking the resort’s website. One article cannot do this property justice. My hope is for it to pique your interest for further investigation if you are searching out a premier upscale incentive or meeting destination. For more information, visit the website or call (843) 768-6000. Read more from this author at The Epicurean Explorer.